Mobile devices account for nearly 7 per cent of web browsing in the US, according to a new report by comScore. In the UK it has been predicted that mobile browsing will overtake desktop browsing in 2013. Although the comScore study is based on US device use, it has lessons for UK publishers as they consider mobile-friendly websites, smartphone and tablet apps and the potential revenue from relatively new products such as iPad magazines. Around half of the US population uses the internet on a mobile device, which has increased by almost 20 per cent in the past year. Two thirds of the 6.8 per cent of mobile web traffic took place on phones during August; one third of that figure took place on tablets. 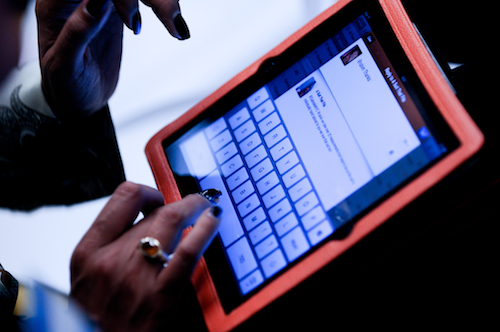 iPads dominate among tablets in the US, accounting for 97.2 per cent of all web tablet traffic. iPads have begun to overtake iPhones in being used for web browsing. iPad browsing accounts for 46.8 per cent of iOS internet use, 42.6 per cent takes place on iPhones. The study found that more than one third of mobile phone web browsing took place via WiFi in August. Conversely, people are increasingly using tablets, which traditionally required a WiFi connection to access the internet, to connect via mobile broadband. In August, nearly 10 per cent of traffic from tablets occurred via a mobile network connection. Three out of five tablet owners consume news on their tablets. Apple devices such as the iPhone and iPad accounted for nearly 60 per cent of the mobile web browsing; Google Android just over 30 per cent, BlackBerry RIM just 5 per cent, and other platforms nearly 5 per cent. In a release, Mark Donovan, senior vice president of mobile at comScore said the findings show an “explosion in digital media consumption”, labelling those in the use of connective devices as “digital omnivores”, consumers who access content through several touchpoints during the course of their daily digital lives. In order to meet the needs of these consumers, advertisers and publishers must learn to navigate this new landscape so they develop cross-platform strategies to effectively engage their audiences. There are 10 facts on the UK mobile market published in June here. This entry was posted in Mobile and tagged Android, backberry, Comscore, iPad, iPhone, Mobile, mobile internet, USA on October 13, 2011 by Sarah Marshall. This was announced yesterday, the findings of joint research between CNN International and Ericsson, as part of the company’s promotion of its ‘Race-for-Growth’ multi-platform advertising campaign. “CNN has revealed that the international business elite are increasingly accessing the internet while on the move,” the release said. This entry was posted in Media releases, Multimedia and tagged advertising campaign, CNN International, Ericsson, mobile device, mobile internet, online audience, wireless LAN on March 11, 2009 by Judith Townend. The French government has presented plans to use about a fifth of the country’s prime television broadcasting spectrum for mobile Internet and television services by the end of 2009. This entry was posted in Editors' pick and tagged broadcasting spectrum, france, French government, iht.com, mobile internet, television services, The French government on October 22, 2008 by Judith Townend. It was all a bit kids in a sweetshop at yesterday’s AOP Digital Publishing Summit, if we forget all the problems with wifi, of course. The main aim, for most attendees, In all likelihood, was to talk to all the people they know in online life, but rarely get the chance to talk to in person – over coffee (and odd looking cake/pastries) and lunch during the day, and drinks in the evening. The programme ranged from panels to energetic speakers with a broad range of digital publishing topics covered – though perhaps not as much new discussion was initiated as some participants hoped, despite Peter Bale from Microsoft attempt to get some answers from YouTube’s Jonathan Gillespie. Emily’s Bell’s vision for Guardian’s international reach: In the panel introducing ‘the digital pioneers,’ Bell, director of digital content for Guardian News & Media, said the group sees now as a ‘uniquely’ timed opportunity for the brand to expand internationally – and to do so before their rivals do. Speaking to Journalism.co.uk afterwards, Bell elaborated on her example of the Economist’s well-established grasp of the international market. Although it happened for the Economist over a 20-year period, she told me that a similar endeavour in 2008 is ‘compressed’ by the web. Bell also pointed out during the panel that the Chinese words for ‘crisis’ and ‘opportunity’ are one and the same (I tried to keep that in mind as my laptop charger physically broke and the wifi went down). The Guardian’s move stateside was also referred to by Saul Klein, partner of Index Ventures and moderator of later panel ‘Growing in the Digital World’. Quoting Simon Waldman, Guardian Media Group’s director of digital strategy and development (and Emily Bell’s boss), Klein said the Guardian’s acquisition of ContentNext was ‘well set up to exploit’. Waldman explained how moves like that prepared the group for a US audience. The ‘Unlocking the mobile internet’ panel: In the spirit of the thing, TechCrunch’s Mike Butcher gave out his mobile number for questions before probing the panel on their respective views on mobile internet’s future. “We just want to give you anything you may want,” she said of ITV’s mobile strategy, though she admitted that building advertising revenue was very much an ongoing issue. Goodwin also revealed that consumers can look forward to Friends Reunited on two iPhone applications in the first part of next year, as reported in more depth over at PaidContent. This entry was posted in Events, Online Journalism and tagged advertising revenue, AOP, aop digital publishing summit, Association of Online Publishers, Conde Nast, condenet, CondeNet International, ContentNext, controller, controller of mobile, director of digital content, director of digital strategy and development, Economist, Emily Bell, guardian, Guardian Media Group, iPhone, IPod, ITV, Jonathan Gillespie, Journalism.co.uk, Melissa Goodwin, microsoft, Mike Butcher, mobile internet, online arm, online life, online presence, Peter Bale, President, Quoting Simon Waldman, Saul Klein, Simon Waldman, Stefano Maruzzi, TechCrunch, The Guardian, United States, YouTube on October 2, 2008 by Judith Townend. Microsoft has opened up the technology behind the New York Times’ e-reader to all publishers. The Times Reader format, which creates a digitised version of the paper browsable on or offline, is now freely available to publishers. The system has already been implemented by some publishers, Michael Cooper, director of advanced reading technologies at Microsoft, told delegates at the World Association of Newspapers (WAN) conference. “What took Microsoft and the New York Times 18 months to develop has been adopted by other publishers in less than six weeks,” he said. The technology, Cooper said, will allow publishers to deliver content to a range of devices in one go. The growth of the mobile internet will not eliminate the need for the e-reader technology, he added, because of the format and offline accessibility to news it offers. However, the next stage of the technology will be to develop it for use on mobile phones. This entry was posted in Handy tools and technology, Mobile, Newspapers and tagged director of advanced reading technologies, e-reader, e-reader technology, Michael Cooper, microsoft, mobile internet, mobile phones, the New York Times, The Times, WAN, World Association of Newspapers on June 4, 2008 by Laura Oliver. The launch of the world’s first ‘newspaper’ telephone by Swedish newspaper Dagens Nyheter (DN) was part of a plan to establish it as a recognised platform for news, DN’s head of mobile told an industry forum today. DN launched the phone in partnership with Nokia and Nordic mobile service provider Telnor in December to give users instant access to the paper’s online content, Johan Brandt told the digital media roundtable at the World Newspaper Congress. “We did this because we had three challenges [with mobile]. We had to get people to realise we had a pretty good mobile site. Many people just didn’t know that they could find news from the mobile internet, not enough people were aware of it as a channel,” he said. In order to promote the newspaper portal, he added, it was important that the phone allowed users to assess DN’s mobile service in a single click and surf those web pages without incurring charges for downloading data. The service, he added, is now attracting 50,000 unique users per month – up more than 40 per cent from last year – but there remained significant factors hampering the development of the mobile phone as an established platform to deliver news and on which newspapers can make significant revenue. He identified a lack of standardised technology and measurement across the mobile market as the primary drawback to significant growth. “There are no standards on the mobile market, it’s unnecessarily difficult and hard for the developers to create model services. I want to see growth from the walled garden model to a more open environment,” he said. “Secondly, there is a lack of standards when it comes to advertising and measurement. There are different ad formats for different mobile sites. The market is fragmented and this makes advertisers frustrated and it also dwarves the mobile market’s potential in the short term. “As a result of this there is a lack of strategic integration of marketing across mobile and other platforms for advertisers. In addition to this, he said, it was difficult for consumers to establish the cost of accessing data on phones and that it could prove to be a deterrent to use. “In Sweden there are several hundred mobile phone subscriptions, with different prices for surfing. How can the user really know which subscription to get and what it costs to surf when it’s paid for by megabyte? This entry was posted in Journalism, Mobile, Newspapers and tagged cellular telephone, Congress, Dagens Nyheter, digital media, head of mobile, Johan Brandt, mobile internet, model services, newspaper portal, Nokia, online content, pretty good mobile site, standardised technology, Sweden, Telnor, WAN, WAN 2008, wan2008 on June 1, 2008 by Oliver Luft. Online Journalism China: There’s an expanding array of tools to supply uncensored news – but how many are prepared to listen? To add to our burgeoning hoard of international bloggers, Journalism.co.uk has recruited China Daily’s Dave Green to write about online journalism in China. I recently fell into conversation with a Beijing taxi driver regarding his opinion on the situation in Tibet. His view was that he really had no idea who to believe, as he felt the government-controlled news sources could not be relied upon to provide a truthful account of what was really happening, and, even if he could read English, he would be reluctant to trust Western news sources either. As an employee of China Daily I encounter on a daily basis the worst of China’s state-peddled misinformation and propaganda. While it is true that Chinese language newspapers are sometimes prepared to go against the grain and report the truth, the reality is that all traditional media sources are state controlled, and those who wish to dig deeper must do so on China’s burgeoning blogosphere. The cautionary tale of Zhou Shuguang illustrates the dangers Chinese bloggers face when attempting to bring the truth to light. Zhou gained a measure of fame early last year for documenting the plight of a homeowner in Chongqing who refused to give in to the demands of a property developer and allow his home to be demolished. Under the pen name Zola, Zhou publicized the case on his blog and provided up to date coverage with video and still images as the dispute progressed. The publicity Zhou generated eventually led to the authorities reaching an agreement with the homeowner, inspiring Zhou to continue exposing similar cases. However, his work, which was funded by a mixture of interview payments and donations, came to an abrupt end in November last year after he travelled to the city of Shenyang in northeast China. There, he met with a number of defrauded investors who had been promised a 30 per cent return for providing for an aphrodisiac powder. The scheme was, of course, (ant) pie-in-the-sky and resulted in an army of angry investors demanding compensation and government action. On his way to an interview, Zhou was picked up by Chinese police and told in no uncertain terms to get on a plane home and cease his activities. He has since returned to his native home to open a business selling vegetables. Zhou’s short-lived crusade raises a number of interesting issues, not least how he managed to keep his blog open. Unsurprisingly, Zhou Shuguang’s Golden Age blog was added to the list of blacklisted websites soon after he began work, which prevented it being accessed in China. However, Chinese netizens, led by blogger Isaac Mao are now increasingly hosting their blogs on servers outside the Chinese mainland. While this still requires viewers to circumnavigate China’s firewall via the use of proxy servers, it does mean they are safe from being totally shut down by the authorities. As John Kennedy documents on his excellent Global Voices China blog, the work of AIDS and environmental activist Hu Jia has inspired an increasingly net-savvy population to continue using the highly-encrypted services offered by Skype and Gmail to communicate. Skype drew criticism in 2006 for partnering with TOM Online, a mobile internet company based in China, to restrict Chinese netizens to downloading a modified version of the software that incorporates a sensitive word filter. However, for those who intend to seriously pursue citizen journalism in China, obtaining original Skype software is not a problem, and Zhou Shuguang used it extensively to interview people regarding the sensitive topics that he covered. Those who choose to try and provide uncensored and accurate news in China have an expanding array of tools to help them win the battle with the censors, there are also tools to help read and watch their material behind the firewall. However, as James Fallows says, the wider question remains how many Chinese will be prepared to listen and watch. This entry was posted in Citizen journalism, Online Journalism and tagged activist, Beijing, blogs, Censorship, China, China Daily, China Daily I, Chinese police, Chongqing, Dave Green, firewall, Hu Jia, Isaac Mao, James Fallows, John Kennedy, Journalism.co.uk, media sources, mobile internet, Online Journalism China, Politics, Shenyang, Skype, taxi driver, Tibet, TOM Online on April 15, 2008 by dave green.